eBay launched a new portal for sellers to review fees and is making changes to its seller-fee invoices. eBay is also renaming monthly fees "subscription and onetime fees" on its invoices. 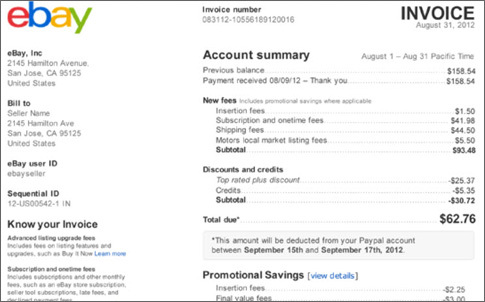 Starting this month, eBay will begin sending an enhanced invoice notification email. "On top of the updates announced in June, this email will highlight key information such as Account status and required action, and include direct links to various seller tools." See your total amount saved through promotions each month. Discover how much you've saved with Top Rated Plus Seller discount and other discounts each month, as well as any credits to your account. Total due: The new gray box below your monthly total lets you know when your automatic payment method will be charged. You can update or change your automatic payment method under My eBay. Know when your PayPal account, debit or credit card will be charged. eBay said it would offer personalization options so sellers could group fees by item number, date and fee type - Sellers go to View Account Status, click on the invoices drop-down menu, and select Personalize Your Invoice. Sellers will also be able to use the new portal page to access an overview of selling fees, access the Fee Calculator and Fee Illustrator, and view video tutorials. See the eBay announcement for details.